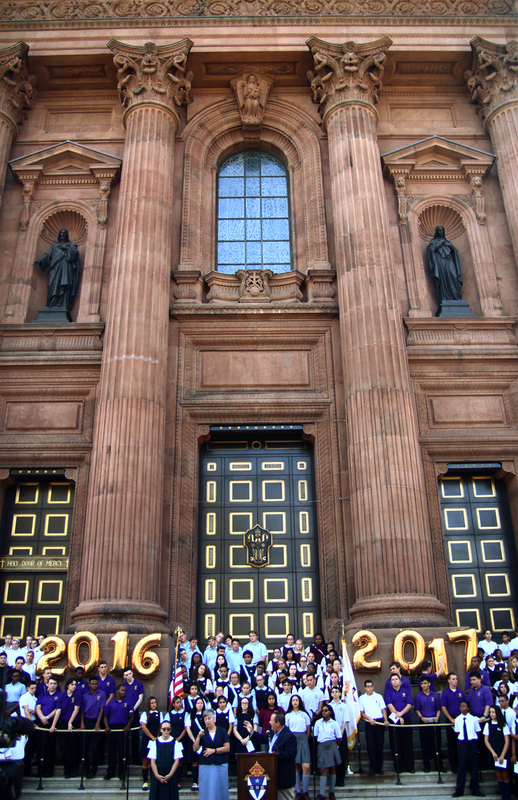 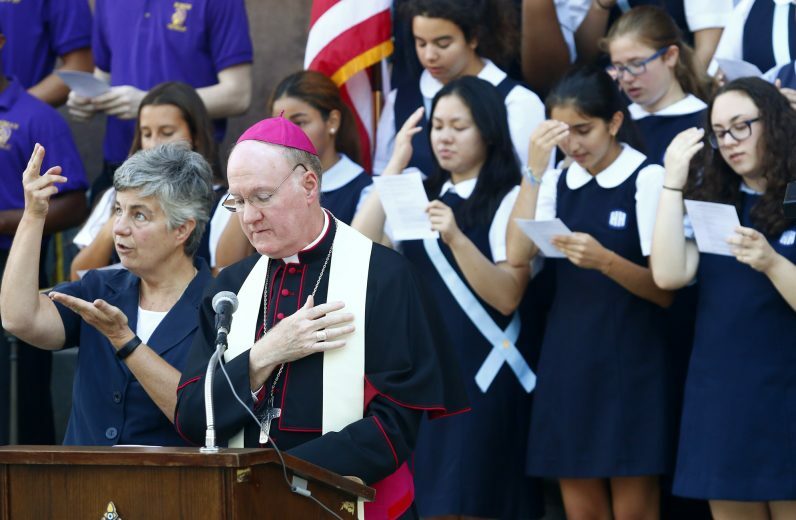 Bishop Fitzgerald leads students in prayer during the back-to-school pep rally on the steps of the cathedral in Center City Philadelphia. 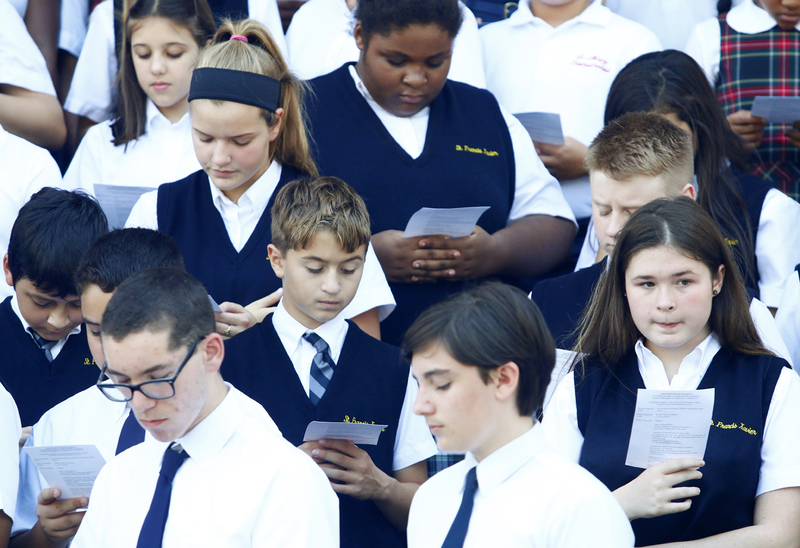 Students pray together at the pep rally. 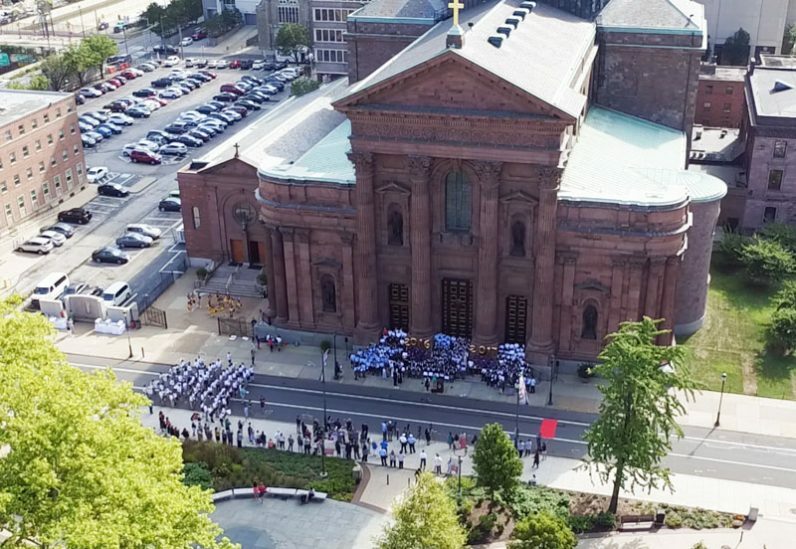 Balloons signifing the beginning of the 2016-2017 school year fly above young men from Roman Catholic High School. 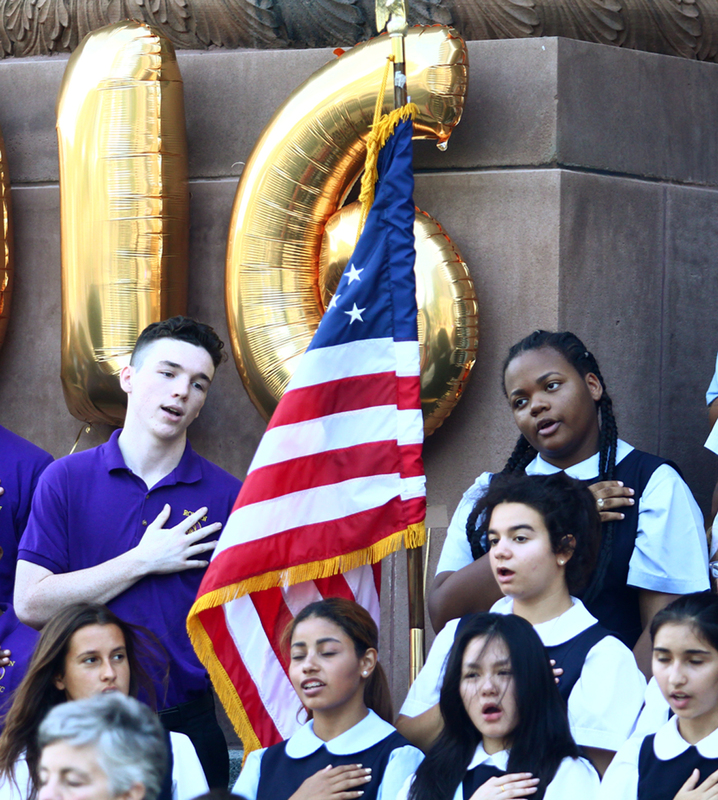 The pep rally begins with the Pledge of Allegiance. 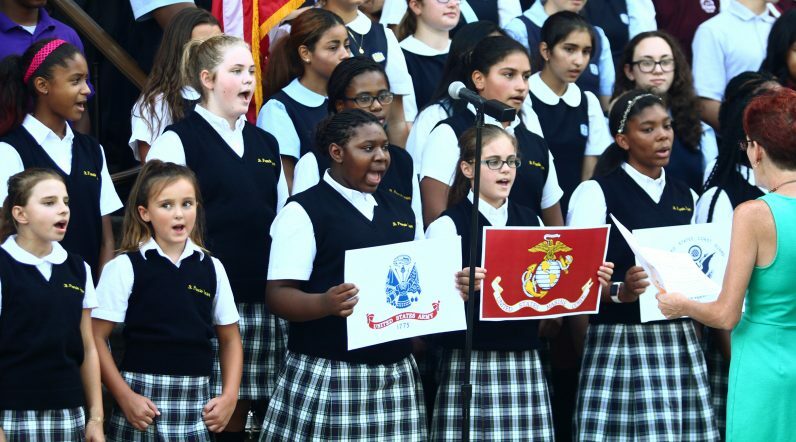 Students from St. Francis Xavier School Choir sing a medley of patriotic songs at the rally. 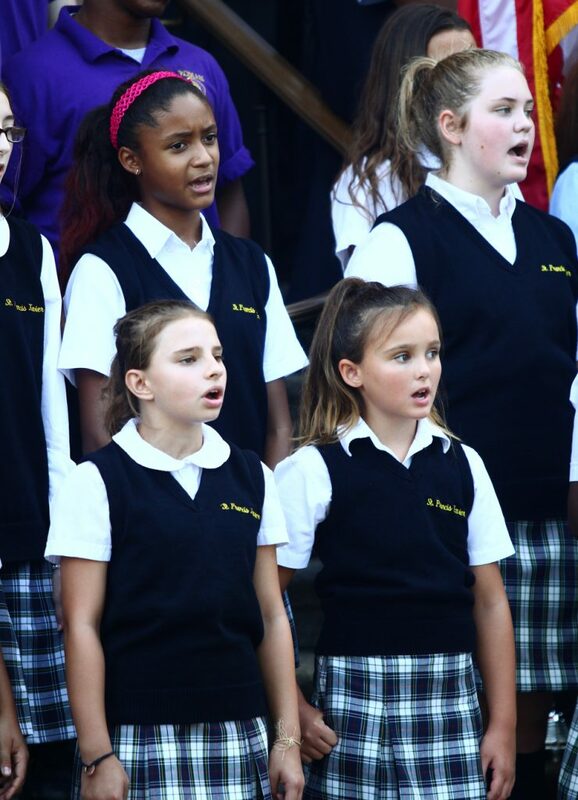 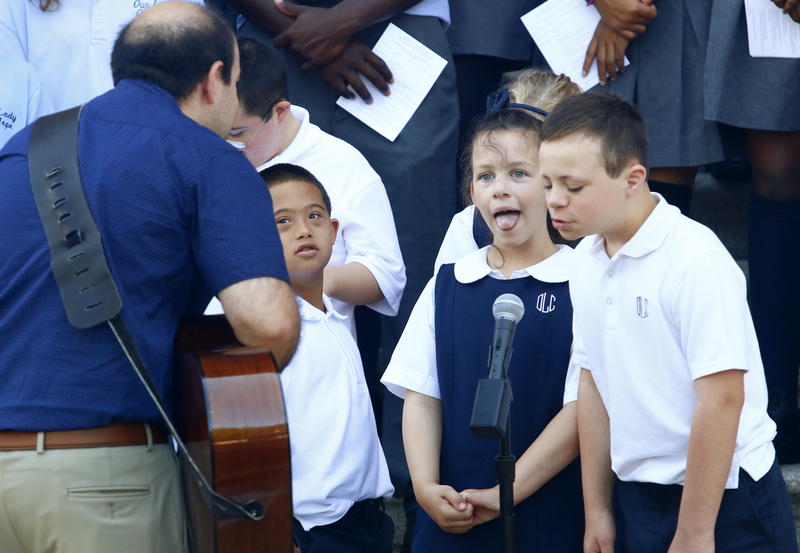 Students from St Francis Xavier School Choir sing together. 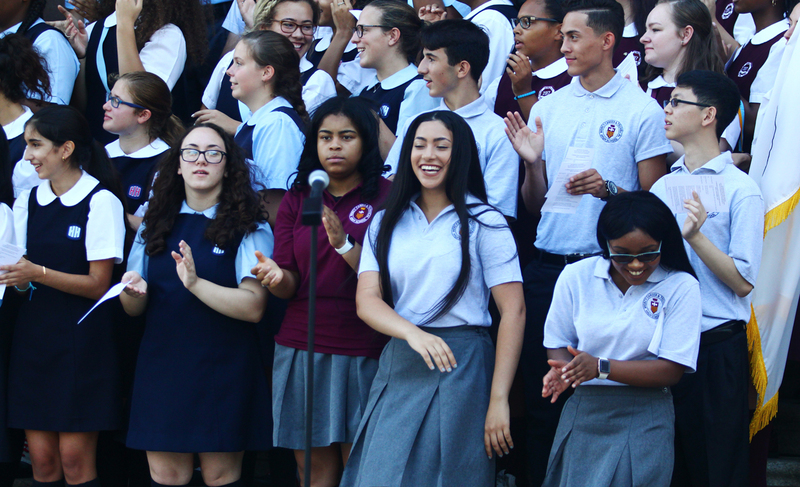 Chris Mominey (center), secretary for Catholic Education, stands with the young men and women and other school administrators at the pep rally kicking off the beginning of the 2016-2017 school year. 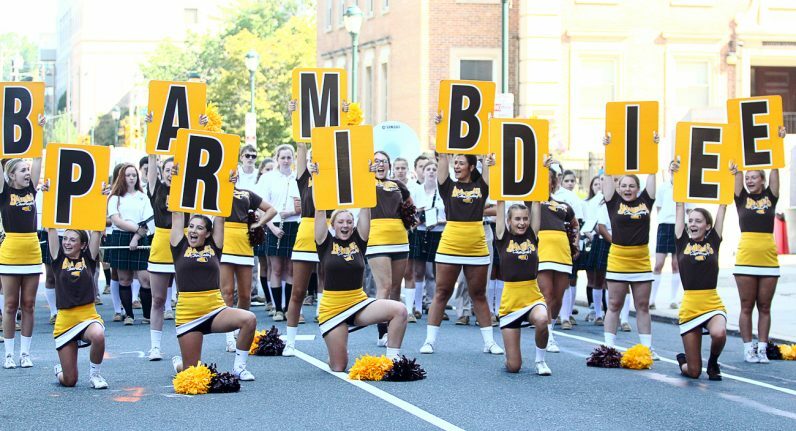 St Hubert High School’s The national championship cheerleading squad from St. Hubert Catholic High School for Girls performs for the crowd. 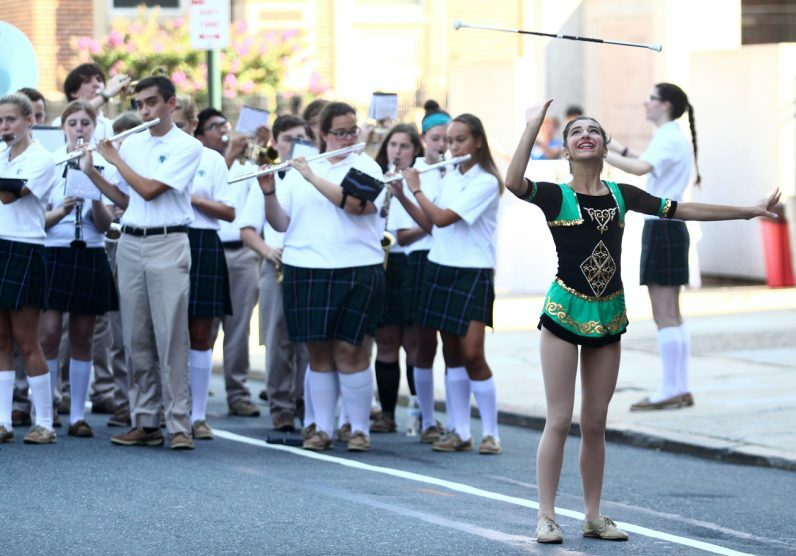 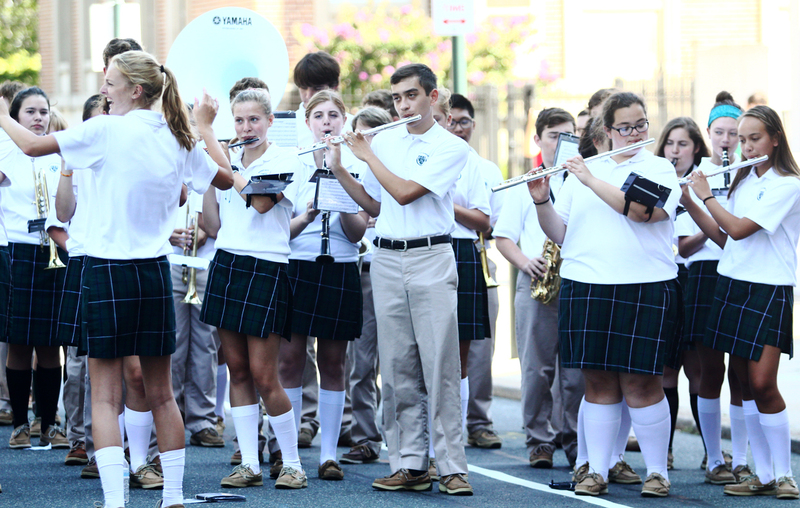 Bishop Shanahan High School’s Jazz Pep Band entertains the crowd on 18th Street in front of the cathedral. 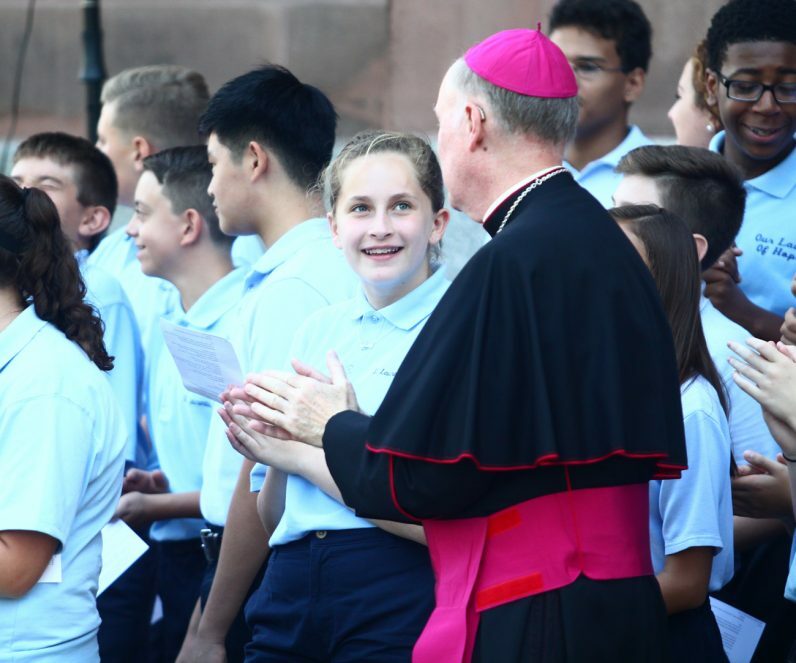 Bishop Michael Fitzgerald chats with Ava Bondura, an eighth grade student from St. Laurentius School. The Bishop Shanahan Jazz Pep Band performs for the crowd at the rally. (Photo by Steve Newbert). 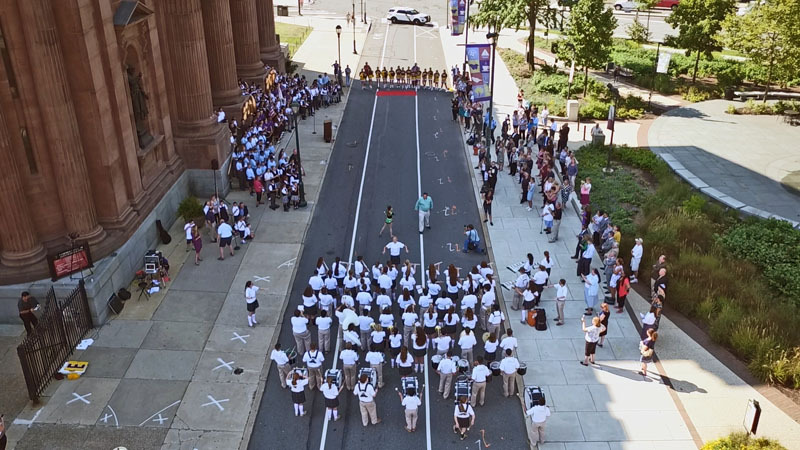 Mascots from seven archdiocesan high schools race to the finish line and the prize of a dress-down day for their school. 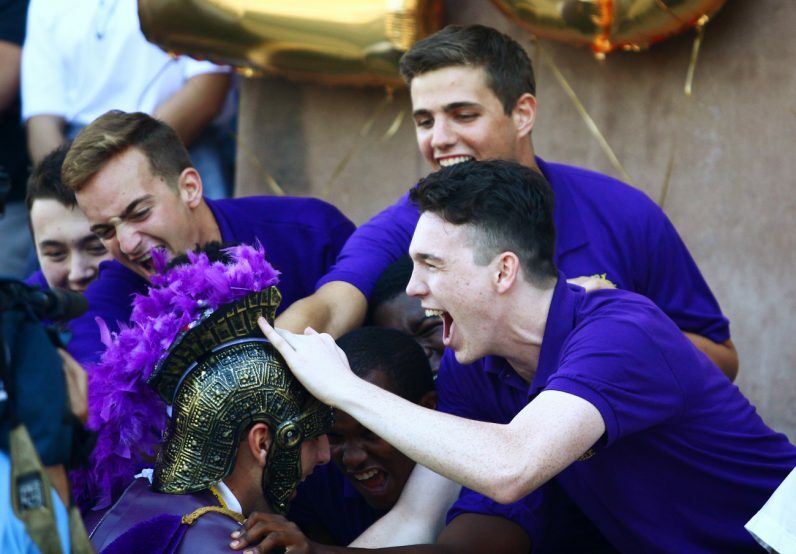 Patrick Doyle (right), student council vice-president, celebrates with fellow Roman Catholic students as their mascot won the race earning them a dress-down day. 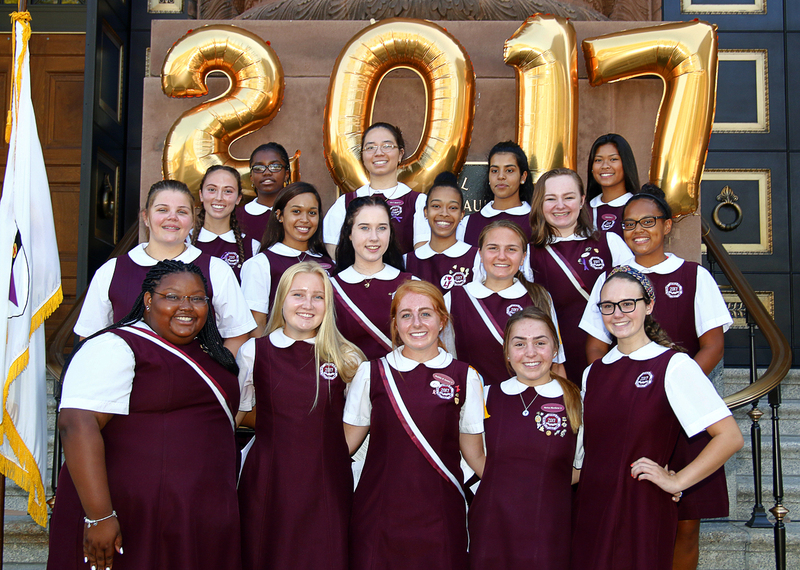 The ladies of Little Flower Catholic High School for Girls are all smiles as they start their senior year. 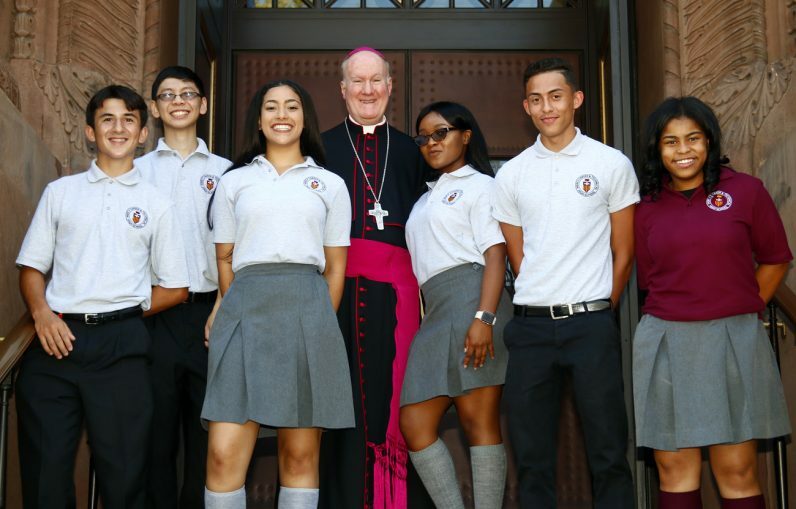 Bishop Michael Fitzgerald greets students from Mercy Vocational High School. 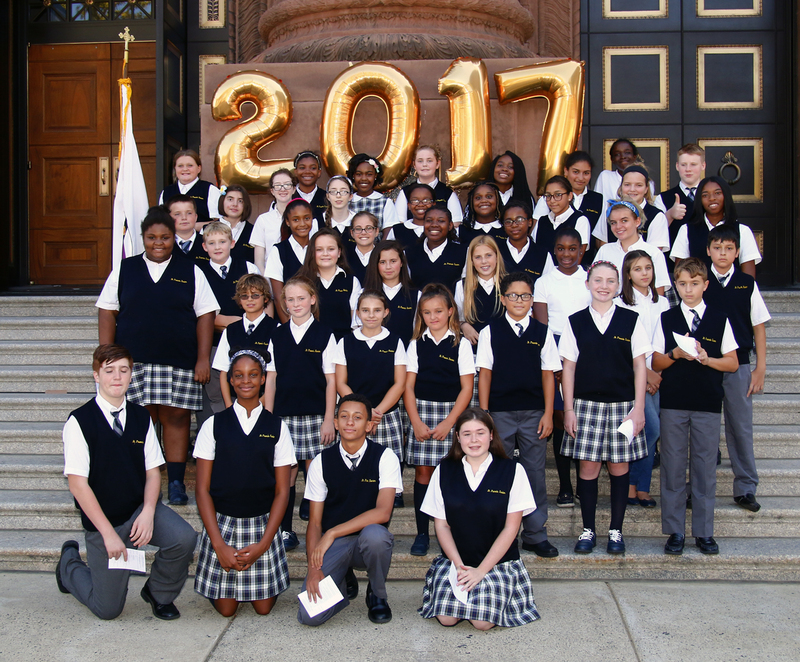 Students from St. Francis Xavier School gather for a picture after the rally. 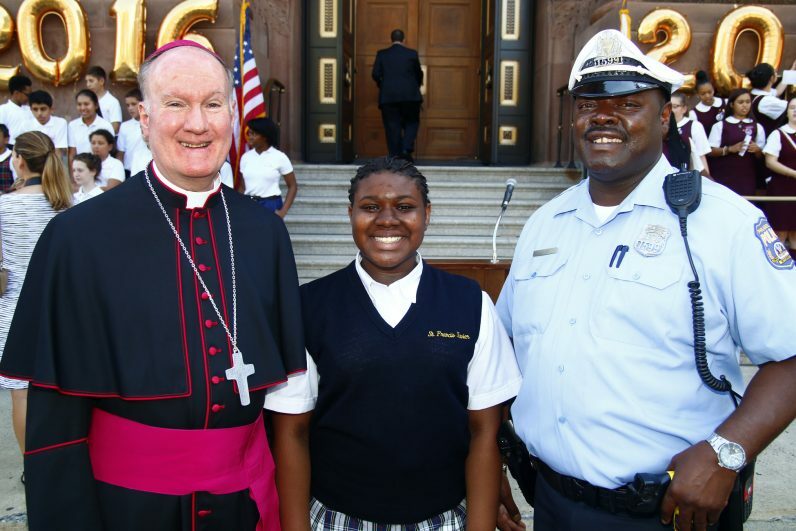 Bishop Fitzgerald poses for a photo with Philadelphia Police Officer Steven Leach and his daughter Gabrielle, who is an eighth grade student at St. Francis Xavier School in nearby Fairmount. Officer Leach was assigned to help with the closure of 18th Street during during the pep rally. All participants of the pep rally pose for a group photo.